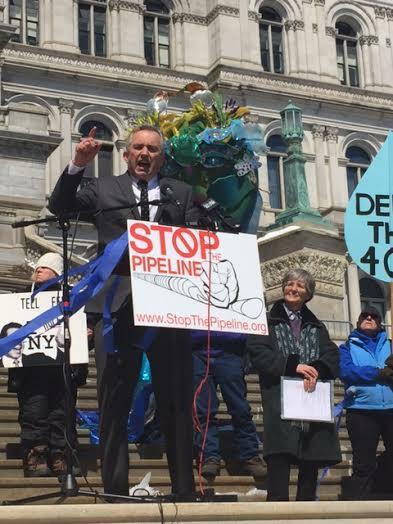 Robert Kennedy Jr speaks at a rally against the now defunct Constitution pipeline at the state Capitol on April 5th. In the past week, two major natural gas pipelines have been scrapped in New York. A third, which would expand a line that is near the Indian Point Nuclear Power plant, is still scheduled, but opponents are putting pressure on Governor Cuomo to use his persuasive powers with the federal government to stop the expansion. Opponents of new pipelines carrying natural gas extracted from hydro fracking have been having a good week. First, Kinder Morgan announced it would not build a planned pipeline through portions of New York State and New England, saying market conditions were no longer favorable. The project faced opposition in several states. Then, on Earth Day ,Governor Cuomo’s environmental agency denied a key permit to the Constitution pipeline, which would have traversed Pennsylvania and upstate New York, saying it could not guarantee that the water near by would be safe. It also condemned tree cutting that had already occurred on the proposed pipeline’s path, which happened even before the permit was denied. Walter Hang, with the group Toxics Targeting is very happy. “It was just a stunning victory,” said Hang, who says it’s the first time a major pipeline has been blocked by a state through what’s usually a pro forma permit process . Among the opponents of the Constitution pipeline are the former brother in law of Cuomo, Robert Kennedy, Junior, who led a rally on the steps of the Capitol earlier in April. “Stop this abomination!” Kennedy said, to cheers. The anti pipeline activists would like to be three for three. They are asking Governor Cuomo to help stop a third major pipeline- the expansion of the Algonquin Incremental Market pipeline. It would nearly double the size of a pipeline that runs very near the Indian Point Nuclear power plant. Cuomo is not a fan of the pipeline’s expansion, but states have very little control over the decisions of the Federal Energy Regulatory Commission, which has authority over the multi state projects. Nevertheless, the governor has written a letter to FERC, questioning the safety of the venture, and says he’s directed four state agencies , including the departments of Environmental Conservation, Health, and Homeland Security to conduct at “comprehensive safety review “. The governor asked construction be halted until the review is concluded. Cuomo’s request to halt the pipeline project near the nuclear plant was denied. The Federal Energy Regulatory Commission said Indian Point’s owners, Entergy, and the Nuclear Regulatory Commission had done their own study and found that the pipeline expansion is safe. The governor has long been an opponent of the Indian Point nuclear power plant itself, saying it’s too close to the population of greater New York, with 20 million people. Cuomo’s environmental agency did issue water quality permits for the Algonquin pipeline in May 2015, the same permits it denied to the constitution pipeline last Friday. Hang, with Toxics Targeting, hopes the governor can find some way to rescind those permits. “I’m sure he could take effective action if he wanted to,” Hang said. Hang says the denial of the water quality permit in New York for the Constitution pipeline can serve as an inspiration to other states who may also be facing opposition to proposed pipelines. Some in the state’s business community have another view, though. The state’s Business Council President says she’s disappointed that “fear mongering” influenced the decision to deny the permits.